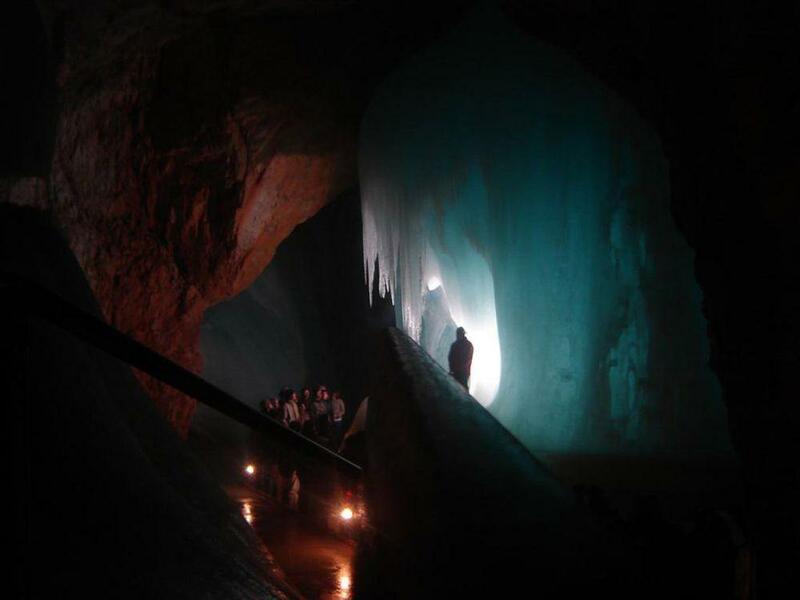 The most impressive known ice cave in the world is Eisriesenwelt – a giant cave not too far from Salzburg. Total length of this cave exceeds 42 kilometres and the first kilometre at its entrance is covered with huge amount of ice which forms beautiful formations. The impressive, beautiful Tennengebirge mountains consist of a giant block of limestone – the largest karst plateau in Salzburg Alps. This thick layer of white limestone has many caves, such as Eiskogelhöhle (another ice cave), Ariadnahöhle, Obere Kemetsteinhöhle, the 1,291 m deep Cosanostraloch-Berger-Platteneck Höhlesystem and many others. Many caves are not explored yet. Several of these caves are located comparatively high in the mountains, in an area with low temperature. As the pressure of atmosphere outside the caves changes, the caves "breathe" – air flows in and out from the caves. Air contains some water vapour – and if the air freezes, vapour turns into ice, forming snow or ice. Thus – if the cave is colder than the outside and if it is large (thus having huge amount of air flowing in and out from it), at its entrance is deposited ice and snow. Such caves are called – dynamic ice caves. Entrance in Eisriesenwelt (see the people in it) / Janko Luin, Flickr / CC BY-SA 2.0. Here, in Tennengebirge, is located world’s largest dynamic ice cave – Eisriesenwelt (World of the Ice Giants). This is a natural cave which was formed by a water, seeping through limestone and dissolving it: just like many other karst caves around the world. Main, lower entrance is an impressive, 20 m wide opening in the cliff. 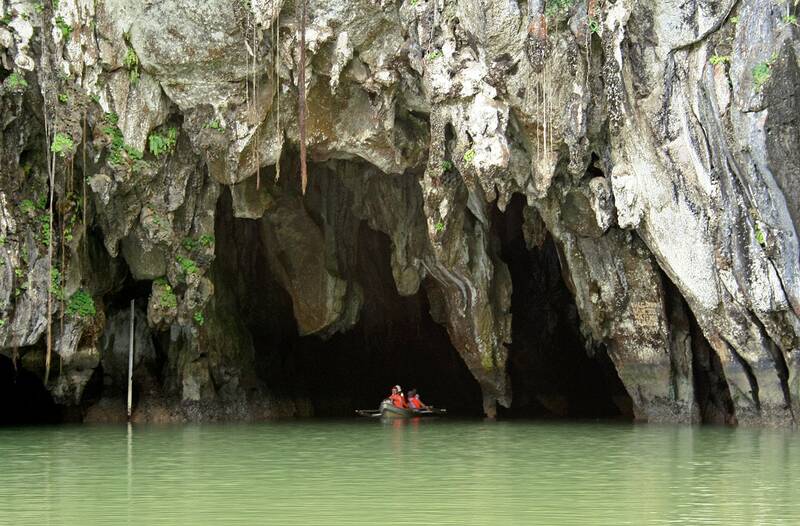 It located in the height of 1,640 m but there might be more entrances – cave is not fully explored. Total length of passages exceeds 42 km and the vertical difference between the lowest and highest part of the cave is 407 m.
Although very large, otherwise this would not be an outstanding cave if not the ice formations at its entrance. The ice formations in Eisriesenwelt are more impressive than in any other known ice cave in the world. Ice here extends for a bit more than 1 km and over a vertical distance of 134 m.
Ice formations in Eisriesenwelt / Dale Harvey, Flickr / CC BY 2.0. It is assessed that here are at least 30,000 m³ of ice "spread" over 27,890 m² (2). Ice is covering the passage, forming countless icicles, columns, curtains, icefalls. 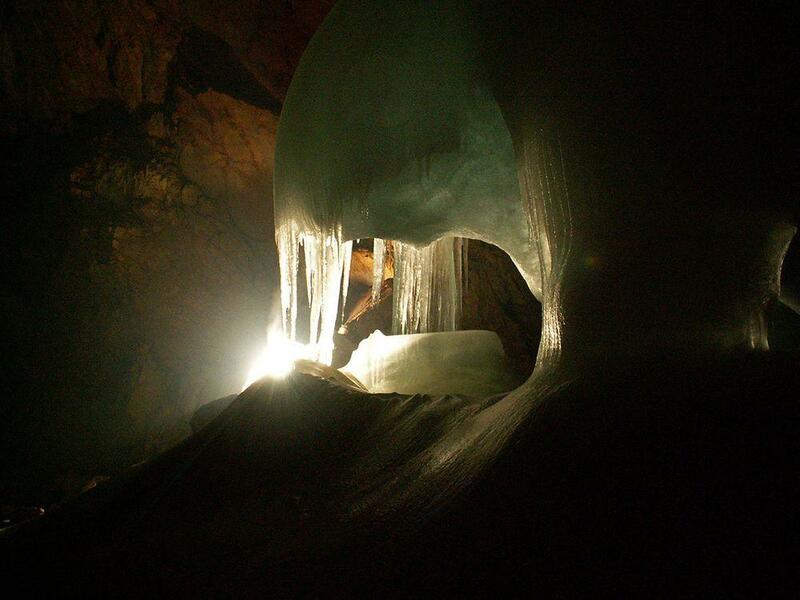 Thanks to this Eisriesenwelt has a very special beauty, differing it from most other caves in the world. Although the cave is located high in the cliffs, locals knew about it. Nevertheless they did not have any wish to enter it – it was considered that this is entrance in hell. 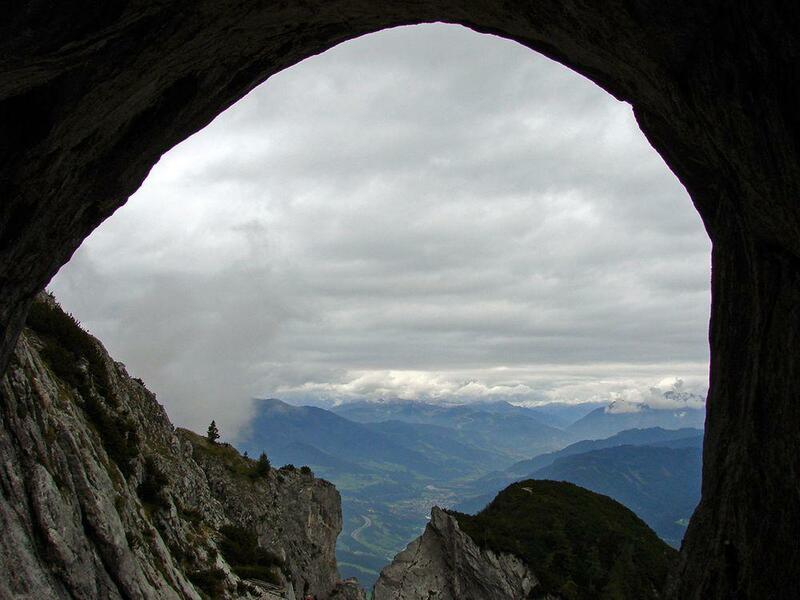 First known explorer of this cave was Anton von Posselt-Czorich from Salzburg. He explored the first few hundreds of metres in 1879 until he reached enormous ice wall which prevented futher advance. Work of Posselt was almost forgotten when the next explorer: Alexander von Mörk started exploration in 1912. In 1913 he managed to overcome the Great Ice Embankment and started to explore and chart the long passages behind it. He managed also to cross an ice cold syphon – Stormsee by greasing himself with tar and then diving through it. This brave man fell a victim to the World War in 1914 and his ashes are now in the cave. On 26th September 1920 there were established the first routes towards this cave and the cave became a tourist attraction. On August 1929 it was declared a natural monument. Ice formations in Eisriesenwelt / Nathan Wong, Flickr / CC BY 2.0. 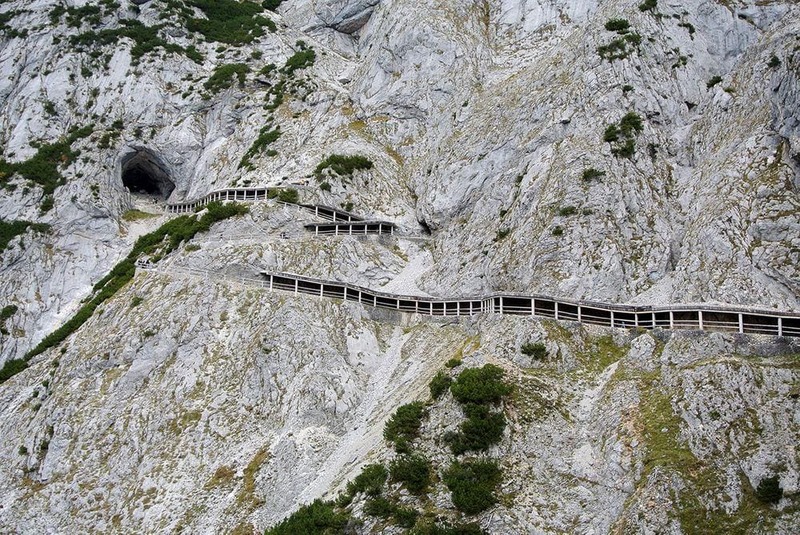 In 1955 there was built a cable car to the cave and now it was accessible to mass tourism. The cave is visited by some 200 000 people every year. Visitors are allowed only in the first kilometre of the cave – but this is by far the most beautiful part of the cave. Cave is open to tourism from May to late October. Tourists enter the cave and visit Posselt Hall with large stalagmite – Posselt Tower – in the centre. From this hall one can see the most impressive ice formation – the Great Ice Embankment which rises 25 m high and other formations. Further tourists visit Alexander von Mörk Cathedral – enormous cave room where the ashes of Alexander von Mörk are located. And finally tourists visit the Ice Palace and then turn back. 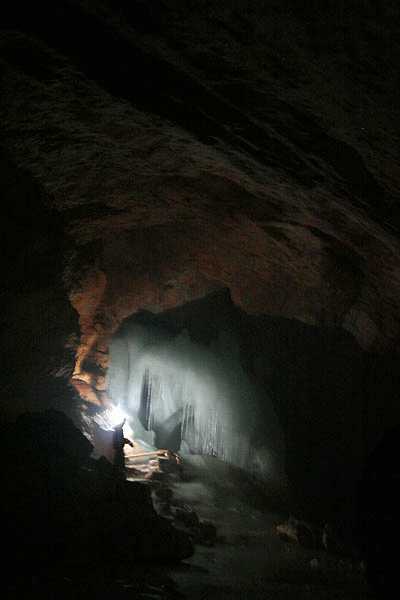 Beauty of this cave (and – income from the tourism to local communities) depends on the condition of ice in the cave. At the same time it is clear – glaciers in Alps are retreating, winters become warmer, even in Antarctica ice seems to be melting – global warming is there. It should affect Eisriesenwelt sooner or later. Ice formations in Eisriesenwelt / Pedro Caetano, Flickr / CC BY 2.0. Research shows that ice in the cave might be melting indeed – total mass of the ice, its thickness seems to be decreasing. Outside the cave the medium yearly temperature is 4.0 °C but in the iced part of the cave the medium annual temperature is slightly below zero: – 0.45 °C. Thus it represents a giant refridgerator. Throughout the year there are some temperature fluctuations, but outside the cave the average seasonal temperature fluctuates for 17 °C, while inside the cave only for 1.5 °C (1). In winter the temperature in cave drops slightly to -1.5 °C but in summer it rises slightly above zero: +0.1 °C. Thus the ice formations in the cave are changing constantly – at some periods the ice melts away and then the frozen air brings new ice, creating new bumps, columns and ice flows. Ice formation in this unique cave has happened thanks to coincidence of many circumstances and slight changes in the cave climate might lead to the loss of the unique natural heritage. It seems, that, for example, closing the cave with doors during the summer might help to preserve the ice. But further climatological research is needed in order to understand how maintain this beautiful natural monument. J. Milius, C. Petters. Eisriesenwelt – From Laser Scanning to Photo-Realistic 3D Model of the Biggest Ice Cave on Earth, GI_Forum 2012: Geovisualisation, Society and Learning. 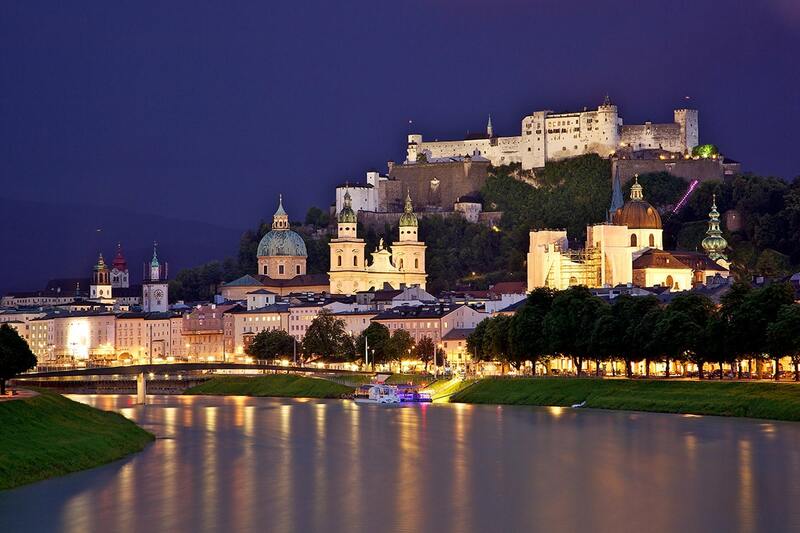 Austria has very rich man-made heritage and especially interesting are historical, picturesque cities and towns, the magnificent palaces of this former centre of power in Europe and several amazing monasteries: treasure troves of knowledge and art values. Ice Caves synthesizes the latest research on ice caves from around the world, bringing to light important information that was heretofore buried in various reports, journals, and archives largely outside the public view. Ice caves have become an increasingly important target for the scientific community in the past decade, as the paleoclimatic information they host offers invaluable information about both present-day and past climate conditions.